Selina Thompson, Race Cards. Photo by Manuel Vason. 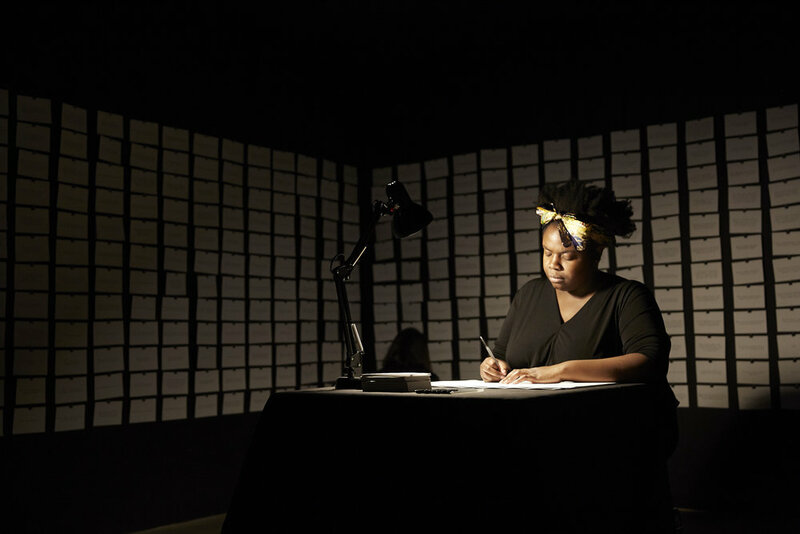 In asking one thousand questions about race, Thompson invites visitors to explore both immediate and abstract racial tensions. She's interested in the boundaries of what makes us uncomfortable and why. Many of her questions ask us what we think is appropriate, what do we think a word means, how does this sentence make us feel. Before leaving, participants are asked to select two questions. The first, you answer, clipping your response behind the selected card. The second, you take with you. Question 375: How is the world shaped by the questions we ask it? Which, in turn, seems to beg: How are we shaped by the questions we ask ourselves? Race Cards feels like a conversation, which is why, when salt. begins, I already know a few things about Thompson: that she’s funny; that she can pivot from humour to rage, sadness to joy, with a precision and grace; that she can hold your attention, keep you at the edge of your seat for hours. On stage, as she describes her travel by cargo ship, retracing a portion of the Transatlantic Slave Triangle, she is all these things and then some. Selina Thompson in salt. Photo by Richard Davenport/The Other Richard. salt. is touched with alchemy. Thompson’s story is structured around elements. She represents the cargo ship using salt and stone, waves projected behind her head. Her sea journey is juxtaposed with anecdotes of airline travel. Here, Thompson appears on stage in a pillar of light—only her face and a slice of her dress visible, airy, half-incorporeal. The imagery culminates in the centret of the Atlantic. Thompson feels herself capsize. She describes herself turning into salt, turning into those that “didn’t complete the transformation,” that didn’t survive the violence. Thompson questions how transformation can become entangled with legacies of violence. Some of the violence she explores is explicit. When she recounts a blatantly racist story a schoolteacher told her grandmother, someone in the audience gasps. Another gasp when Thompson repeats the slur hurled at her by the cargo ship’s master—yes, Thompson underlines, master. She takes a piece of the salt – symbolizing, here, “the hull” – and, using a mortar and pestle, grounds it into dust. From Sharpe: “The first language the keepers of the hold use on the captives is the language of violence” (70). 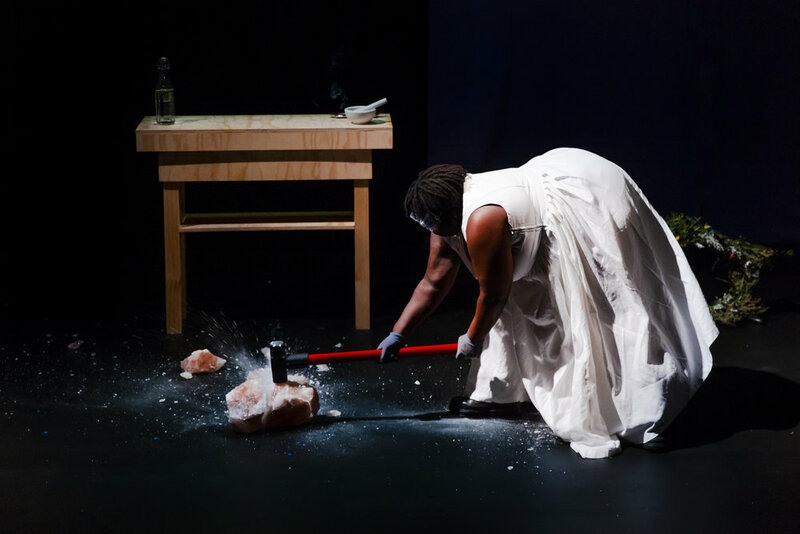 In one of the performances most memorable sequences, Thompson lines up large chunks of salt, one for each group on board the cargo ship – herself, her Black collaborator, the Filipino crew, the Italian ‘master’ – and the forces that influence it – the Unions, the countries, Capitalism, Imperialism. With a sledgehammer, she pounds at each one to varying degrees, distributes violence, makes it more legible. (We might ask, more legible to whom?) Everyone is implicated in the world slavery created. How, Thompson asks, did violence transform the enslaved? How does it continue to transform its inheritors? And, in giving these forces shape and size, she opens another door: how might we transform this violence? I do recommend seeing both. Both the performance and the exhibit are interested in being resources, in being malleable – in being taken up, reshaped, used by their audience. So, what will you do with your piece of salt? There’s still time to catch the last week of PuSh Fest - find showtimes, tickets, and more info at pushfestival.ca .